‘Moroshka’: This is a little film with a storyline based on a little girl and a large beast, beloved by many thanks to films like Monsters Inc. and TV series such as Masha and the Bear. A total of 139 short films from the UK, Germany, Korea, the U.S., India, Italy, Japan, France and other countries were shown at the 2016 edition of the KROK international animated film festival, held in Russia from Sept. 30 to Oct. 7. Here are the seven most interesting Russian entries from this year’s festival, according to RBTH. This film gives a passing nod to animated documentaries; a film trend which has its roots in the unforgettable Waltz with Bashir by Ari Folman from 2008. Svetlana Razgulyayeva uses many features common to the genre of animated documentaries in her film: live sound, spontaneous dialogue and incoherent, confused speech. On camera you can even see a little red dot, as if evidence of the fact that this is filmed on a home camera. However, the little red dot, as well as the characters on film, are all made up, and the documentation of the main character’s story is hard to believe, as it is the sad tale of a man who grows a tail. It is likely that it is exactly this mix of credibility and fancy that meant this film was picked for the KROK festival, as well as for the Berlin Film Festival, where Banana represented Russia. Dina Velikovskaya’s camera work and shot composition is something that one rarely comes across in animation, instead, it is reminiscent of films by Russian directors Andrei Tarkovsky and Andrei Zvagintsev. Amid strange scenes, Velikovskaya creates a touching story about a bird that learns too late about the happiness of being a mother. This is a sweet little film with a storyline based on a little girl and a large beast, beloved by many thanks to films like Monsters Inc. and TV series such as Masha and the Bear. 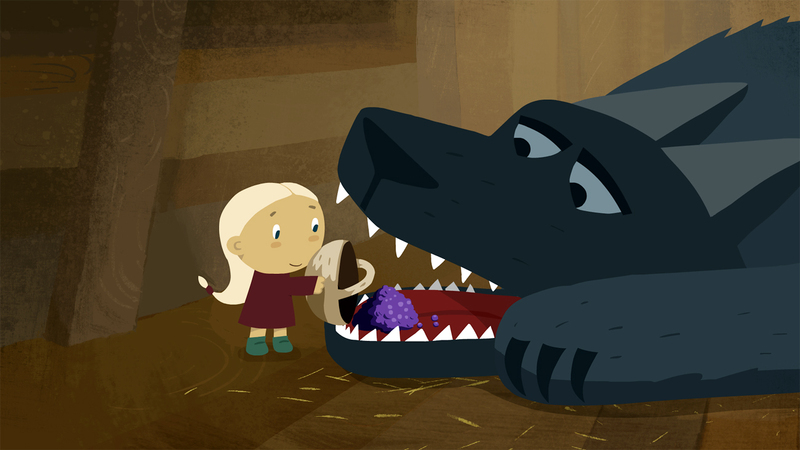 However, this time instead of a big fluffy bear, the little girl Moroshka (which in Russian means “cloudberry”) encounters a hungry grey wolf, which she saves from hunters and then tames. Because of its sweet lyrical notes it is hard to tell for sure whether this tale by Polina Minchenok is a children’s story or a love story; in any case it was shown at several film festivals and represented Russia in the world’s largest animation film festival in Annecy. This is a short satirical story about a simpleton and a hiccupping princess. The main character is like one of the leads from the film Dumb and Dumber: whatever he ends up doing, it always goes wrong. He manages to pour milk into his pockets and put butter underneath his cap on a hot day. But despite all this he still manages to save the princess from danger and lead her to the altar. The film was directed by the 33-year-old Alexander Chernogorovy, whose previous work includes the animated films Fairy Patrol and Cat and Beaver. The film was made using a rare pixelation technique made famous by the Canadian Norman McLaren and his Oscar-winning short film Neighbors. Using photographs and shots of actors photographed frame by frame, Mikhail Soloshenko tells the absurd post-modernist tale of an ordinary flat and an ordinary family, forced to take care of the small, but very restless Alexander Pushkin and leader of the 1917 Revolution, Vladimir Ilyich Lenin…. The film Warm Snow by Irina Elshanskaya was made at the Israeli Bezalel Academy of Arts, however, in most film festivals it is entered representing Russia. This is not just because the director is a Russian citizen, it is also because the setup of the film is extremely Russian: the Soviet kitchen; salted cucumbers; the relationship between a father and his daughter, who is becoming an adult – a sublime mix of household details and transcendental love. Warm Snow from Ira Elshansky on Vimeo. This short film by Yevgeny Fadeyev is not a new production of Shakespeare, as its name suggests. It is the story of one performance of Hamlet, where the camera is not focused on the stage, but on the audience, which is made up of a group of schoolchildren. And a group of schoolchildren can turn even the most tragic story into comedy.